BARCELONA -- Four years ago, Huawei was giving lessons at its trade show booth here at Mobile World Congress (MWC) on how to pronounce the company's name. Now, Huawei is the third largest smartphone maker in the world, behind Apple and Samsung. At a preview event at this year's MWC on Sunday, Huawei launched the P10 and P10 Plus smartphones featuring better dual rear cameras with Leica lenses and longer battery life. Neither will be sold in the U.S., but that didn't dim interest in the devices. The P10 is a 5.1-in. model while the P10 Plus has a 5.5-in. display. Both run Android 7 and use 64-bit Korin 960 octa-core processors. The dual lenses in the rear of both have 12- and 20-megapixel sensors; each has an 8-megapixel sensor in the front camera. The P10 has a large, non-removable 3,200 mAh battery, while the P10 Plus has a 3,750 mAh battery. 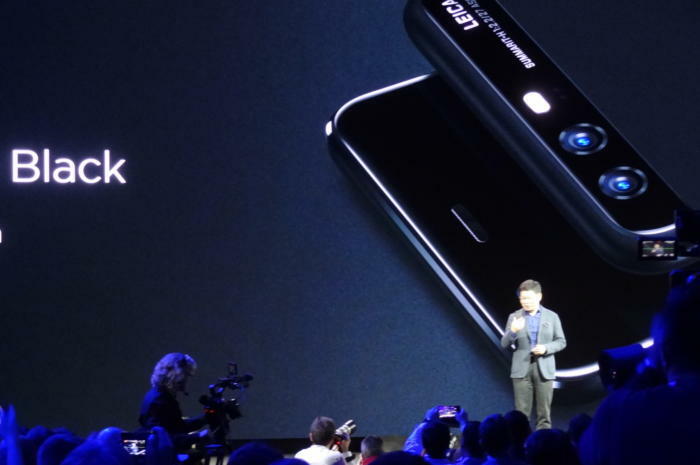 Richard Yu, CEO of the consumer business group at Huawei Technologies, unveiled the company's P10 and P10 Plus camera-phones in Barcelona on Feb. 26, 2017. Huawei's press event was mobbed -- so busy, in fact, that hundreds of reporters never got inside the large downtown venue. That crowd was an indication of Huawei's emerging global popularity, even if it isn't widely known in the important U.S. market. One reporter for an Italian news outlet described Huawei as "very popular now" in his country. The new phones will be released in March in 30 countries, including China, the UK and Mexico. Pricing starts at 650 Euro ($687) for the P10 with 64 GB storage, which makes it somewhat more affordable than the bSamsung and Apple flagships. Analysts figured that Huawei likely decided to skip a U.S. launch for the phones after releasing the Mate 9 for about $600 early January. That makes it too soon to introduce yet an other higher-end phone in the U.S.
"They're probably holding off on the P10 in the U.S. for a bit to avoid overlap of their leading-edge phones," said Bob O'Donnell, an analyst at Technalysis Research. Thomas Husson, an analyst at Forrester, said Huawei is "way below" Samsung and even LG in the U.S. in terms of brand awareness. IDC ranked Huawei third globally in the fourth quarter of 2016, but only 10th in the U.S. for the same period. Huawei needs to "develop brand personality," Husson said. "This will require significant marketing dollars and possibly the use of of smart tactical marketing such as levering online communities, social media, brand content and an innovative approach." That said, Huawei seems to be doing well enough -- at least at MWC -- without having a big presence in the U.S. market.